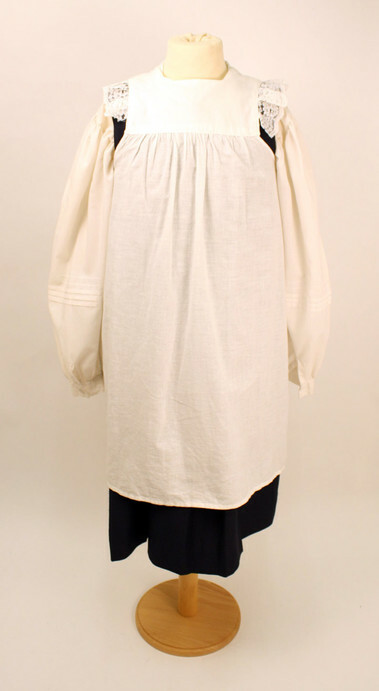 This school uniform is a replica of one worn in the 19th century by a girl aged between 12-15. The uniform is made up of a blouse, tunic dress and pinafore. The white blouse has a round collar and fastens down the front. The starched white pinafore goes over the top of the blue tunic, and is buttoned at the back. Back-buttoning pinafores were common in the middle of the 19th century. Sometimes boys wore pinafores too. Pinafores were large and roomy to let the children move freely, play and run about at break times. And children did drill, which involved a series of stretches, jumps and movements, in class. A white pinafore was worn over the blue dress to keep it clean and tidy. School pupils wrote using ink and they often wiped their inky hands on their clothes. The pinafore stopped the blue dress from becoming stained with ink smudges. Younger children used slates and pencils and the pinafore kept the dust off their clothes. White pinafores were often part of the school uniform for children at church schools and charity schools. They covered the child's ordinary clothes. A starched white pinafore looked clean and smart. Victorian schools were often very strict about appearances. 'Cleanliness is next to Godliness' was a frequent saying. Children were inspected regularly. They were expected to have clean clothes, hair and nails. Boys had to have short hair while girls were expected to tie their hair back neatly. In Victorian times, there were big differences in what children wore to school. Children from rich families wore uniform at their private schools. Middle class children usually wore their ordinary clothes to school, sometimes with a pinafore over the top to protect their clothes. Poor families could not afford clothes for their children and so children wore old clothes until they became ragged and fell apart. These children went to charity schools called 'ragged schools' named for the ragged, shoeless and hungry children who attended them. A ragged school in Stepney, East London, was founded by Dr. Barnardo. In the 19th century prestigious private schools like Eton adopted the school uniform. The boys wore a short 'bumbreezer' jacket with a wide stiff 'Eton' collar, and a top hat or cap. There were a few private schools for girls too in Victorian times, though many girls of wealthy parents were taught at home by a governess and so didn't need to wear a uniform. Middle class children were often sent to church schools where they were taught the 3R's (reading, writing and arithmetic) and given religious and moral instruction. The children spent a lot of time copying work from the blackboard into their 'copy' books, or onto slates. They usually wore their everyday clothes to school with a starched white pinafore over the top to protect the clothes from ink and other stains. Girls wore dresses and pinafores to school while boys wore trousers and a shirt, and sometimes a waistcoat or pinafore. Victorian children did not have many clothes. Middle class children may have only had a couple of outfits, and they did not change their clothes every day. So it was important to keep their clothes as clean as they could, and the pinafore protected their clothes from wear and tear. Children often learnt practical things at school. Girls did sewing and cooking while boys did woodwork and sometimes science. Children wore pinafores to do these activities. Sometimes the schools provided pinafores to children for these lessons. Ragged schools and 'schools of industry' taught trades like shoemaking for boys and laundry work for girls over the age of 12. The students commonly wore pinafores, just like adults of the time did. The popularity of school uniform spread from private schools to other schools at the end of the 19th century. Uniforms varied from school to school, with different colours and crests. A smart uniform was a way of telling one school apart from another. It was also seen as a way of making pupils feel proud to be part of the school. Teachers, governors and parents liked pupils to wear a uniform as a sign of discipline. Many school children still wear a uniform although styles and fashions have changed since Victorian times. Today, many schools uniforms are made up of sweatshirts and t-shirts, instead of the old-fashioned shirts, ties and blazers and girls can usually wear trousers instead of skirts.